Campaign managers of the world unite! While Obama online organizers are busy trying to figure out how to adopt their online tactics to help them actually govern, Benjamin Netanyahu of the conservative Israeli Likud party has already adopted the look and feel of Barack Obama’s Web site. It’s not surprising that an overseas campaign adopted successful strategies from the US, but Netanyahu in particular may be more familiar with the US political scene, having studied business and political science at MIT. The resemblance to the Obama campaign site is striking; the policy positions not so much. 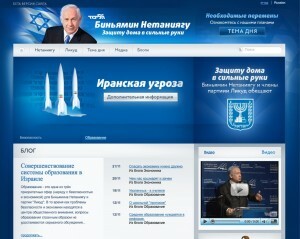 For example, the Russian version of his sight today shows missiles and the text “The Iranian threat” and a button to click for more information. It also allows you to join the party and ways to get involved. The essay is accurate, indeed the Obama’s campaign did have an impact on Israeli politicians regarding tactic of electoral efforts to mobilize resources. However. Israeli politicians have used the internet even before but to a limited degree. What Israeli politicians don’t get, yet, is that the Internet cannot constitute communities rather it may enable to reflect and mobilize communities. The probability of virtual communities to be sustained for long as a source of political resources is limited without off-line roots of a sociopolitical collectivity. I love the great posts in this blog and I have added it to my bookmark, thank you!